Hardware wallets are considered the most secure cold storage options in the crypto industry. Because the coins are stored offline and private keys do not leave the hardware wallets, the risk of getting attacked is low. As the demand for hardware wallets grows, manufacturers have been working extra hard to craft effective products for the market. 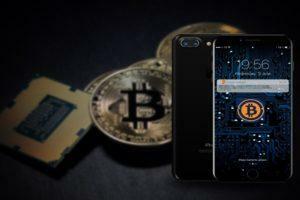 The growing list of wallets can, however, make picking the right hardware wallet for cryptocurrency difficult. Before delving deeper into the hardware wallets’ dynamics, it is important to appreciate how a crypto wallet works. A digital wallet is a storage location designed to store and help manage cryptocurrencies. Note that the storage is done through a set of codes that allow users to link to their respective blockchains and run transactions. The wallets generate private keys that help users to access their coins in different networks to live when running transactions such as sending value. The wallet also generates the private keys that serve as the address to the wallet and seed phrase for recovering lost private keys. The security of hardware wallets comes from their operational design. Here are the three main factors that make hardware wallets more secure than standard web-based wallets. Hardware wallets are always offline. Unlike web-based wallets that are always connected to the internet, hardware wallets store coins offline. Private keys do not leave the hardware when signing transactions. Unlike desktop wallets that use computing devices when signing transactions, with hardware wallets all transactions take place in the wallet, and the keys do not leave the wallet. Some hardware wallets have physical buttons that must be used when running transactions. This means that even if a hacker somehow manages to get your private keys, it is still impossible to siphon your coins without physically having the hardware wallet. If you have been looking for a reliable hardware wallet for cryptocurrency, here is a list of the top five options on the market today. Ledger Nano S is the leading hardware wallet in the crypto industry because of its great reputation, competitive pricing, and ability to support multiple coins. 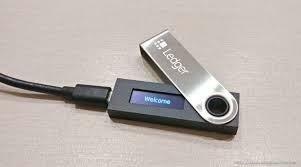 This hardware wallet is designed by a French company, Ledger Company, which aims to provide users with a reliable and secure crypto storage option. The wallet resembles a standard flash drive that makes it easy to use, store, and even carry around without worrying of hacker attacks. The cost of the Ledger Nano S on eBay is $94.5. Ledger Nano S is designed to make its use direct and easy. To use the wallet, you need to download the Google Chrome Ledger Manager App on your device. The data (private keys) is stored in a special microchip hidden deep in the wallet and protected by a pin. In addition to a pin to access the wallet, it also features physical buttons that must be used to confirm transactions. This means that it is impossible for attackers to run transactions without the hardware even if they manage to get access to the private keys. If your Ledger Nano S wallet gets lost, the thief will not be able to access or drain your coins without the wallet pin. The wallet erases the pin and requires the hardware holder to use the seed phrase to regenerate the keys. If you cannot recover the wallet, use the recovery seed phrase to recover the coins. You can direct your coins to another Ledger Nano S wallet or others supported by the respective coin. What Coins Can You Store In A Ledger Nano S Wallet? One benefits of Ledger Nano S Wallet is its multi-coin support. Some of the coins you can store on Ledger Nano S include Bitcoin, Bitcoin Cash, Ripple, Ethereum, and all ERC-Tokens. Trezor is another top hardware wallet that has become popular because of its unique operational and security features. 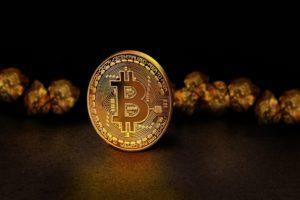 It is a finger-sized device created by Satoshi Labs and released for the first time in 2014. The current price of Trezor on Amazon is $79.99. 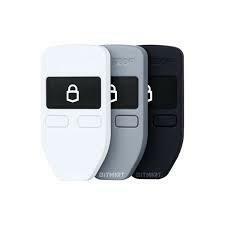 The Trezor system uses a PIN code that provides the user with elevated security. The device generates a scrambled series of numbers when plugged into a computer, and a PIN is required. The user has to key in corresponding numbers on the Trezor app into the computer. This system of randomness and blindness helps to prevent unauthorized people from stealing your PIN. Other features that help to make Trezor highly secure include two-factor authentication and Time-based One-Time Password (TOTP). Its limited USB connection design further helps to protect the user’s private keys even when connected to a computer. The limited USB connection operates like a computer mouse works (if the computer is infected by a virus, the mouse will not be affected). This means that your coins will be safe even if you are using a compromised computer to run transactions. What Happens If Your Trezor Wallet Gets Lost? In the event that you lose your Trezor wallet, you can use the seed phrase to regenerate the private keys and recover your tokens. This means that you will never lose the transaction history and your coins will never be lost as long as you have the seed phrase. When a Trezor user initiates a transaction, the wallet displays the transaction details, such as the amount to be sent and destination address, on the LCD. Note that the transactions cannot be validated until you press two buttons on the hardware. Therefore, your coins can never be wired remotely if an unauthorized person manages to access your private keys. Like Ledger Nano S Hardware, Trezor also supports many cryptocurrencies. This means that if you have an interest in Litecoin and Bitcoin Cash, there is no need to have two separate wallets. Other coins supported by Trezor include Bitcoin, Ethereum, Ethereum Classic, Dash, and all ERC-20 coins. 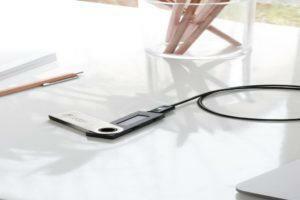 KeepKey is categorized as one of the best hardware wallets because of its minimalistic design and focus on security. In 2017, KeepKey was acquired by a Swiss-based crypto exchange referred to as ShapeShift AG. The current price of KeepKey wallet on Amazon is $85. 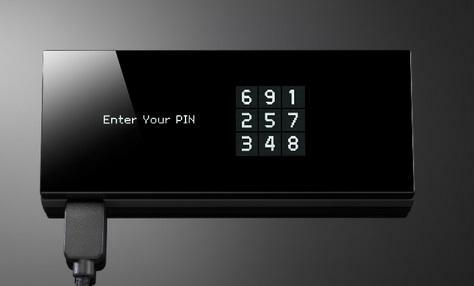 The KeepKey wallet generates its own private keys using a random number generator that factors in the user’s action. 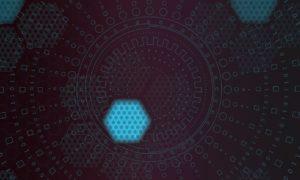 This means that there is no specific pattern that keyloggers can easily decipher to know your private keys. The KeepKey hardware wallet generates a 12-word phrase that the user should use to regenerate the private keys. You should keep the passphrase securely because it is your gateway to recovering stored coins in the case of hardware loss. Unlike the Trezor or Ledger Nano S wallets, KeepKeY works with third-party wallets such as Mycelium, MultiBit, or Electrum. However, you also can install the KeepKey client on the desktop to run transactions. Once the KeepKey client or a supported wallet is installed on a computer, you will be ready to start storing supported coins and running transactions. When you make a request for sending value, the transaction is passed to the KeepKey for manual confirmation. Then, the signed transaction is returned to the computer for execution online. One of the reasons that make KeepKey take the third position in this crypto hardware wallet comparison is that it supports fewer cryptocurrencies compared with Trezor and Ledger Nano S. Some of the coins that you can store at KeepKey include Bitcoin, Litecoin, Ethereum, Dogecoin, Bitcoin Gold, Namecoin, and Dash. 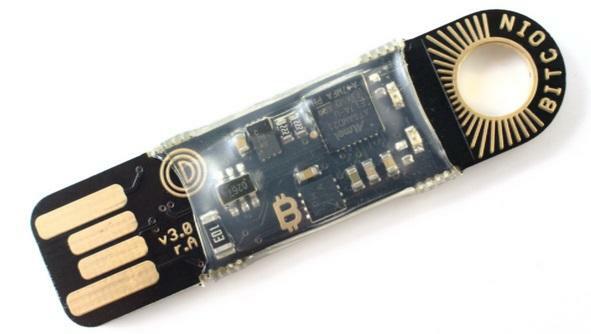 Opendime is one of the lesser-known hardware wallets that introduced a new way of running crypto transactions. Instead of holding the coins, Opendime is meant to operate like fiat currencies. This means that you can save the coins and deliver them using the Opendime stick. Opendime is available for purchase as a packet of three for $39. To set up your hardware wallet, start by plugging it into a computer via a USB port. The setup then provides the user with a guide in a readme file. During the setup, you will be required to input a random file that the Opendime system uses to generate unique private keys. Once the keys have been initialized, the Opendime wallet is ready to use. The private key only resides in the wallet and is considered completely secure until it is opened. To read the key, the user is required to expose it by removing the cover clip. Note that once the private key is exposed, the coins have to be moved to an appropriate wallet in order to be used. Use Opendime to gift a friend with Bitcoin. Consider preloading Opendime with Bitcoin or Litecoin and mailing to the recipient. Opendime can be used for delivering payment for electronics or even cars. You only need to deliver the preloaded Opendime and hand it to the seller for a receipt to be processed. Use Opendime to pay for various services and products in brick-and-mortar stores. Once you have loaded the Opendime wallet, any store that accepts Bitcoin will be able to accept the stored coins. If you load Opendime with Bitcoins, you can sell them directly to users who do not want to follow the lengthy process of following the exchanges such as Binance or Bittrex. Opendime is a secure wallet for storing your coins. Because the private keys are sealed until the cover clip is removed, there is no risk of a third party accessing the stored coins without the physical wallet. The wallet remains completely secure as long as it is kept well in a secure environment. Digital BitBox is another hardware wallet designed by Jonas Schnelli, one of Bitcoin’s lead developers. The primary goal of Digital BitBox is to simplify coin storage by handling the key storage and Random Number Generator (RNG) so that people can use their coins without worrying about losing them. Unlike Trezor or Ledger Nano S, Digital BitBox does not have a screen. Therefore, the management is done via a software interface on a computer. Digital BitBox is available for $44.99 on eBay. Digital BitBox is one of the secure wallets that experts refer to as impenetrable. 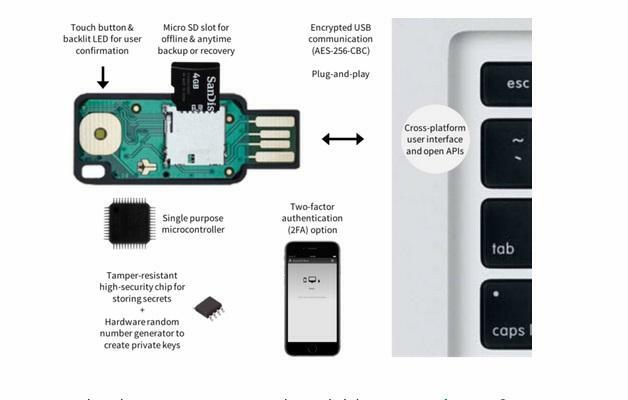 Its design uses two-factor authentication, tamper-resistant chips, and encrypted USB communication that makes it almost impossible for hackers to gain access. To make the process of securing cryptocurrencies more reliable, Digital BitBox allows users to make offline backups using a MicroSD slot. This means that even if the hardware wallet is lost, you still will have a backup on a MicroSD card. As other hardware wallets keep their operational codes closed, Digital BitBox is open source. This implies that developers can freely contribute to improving it to enhance the efficiency of the wallet. The development team relies on this operational design to track vulnerabilities and improve its features. What Coins Are Supported By Digital BitBox? The primary aim of the Digital BitBox wallet was to support Bitcoin. However, it has improved over time to provide support for other coins such as Ethereum, Ethereum Classic, Litecoin, and all ERC-20 tokens. The development team indicates it plans to add more coins to the list of supported coins. Although hardware wallets are not a new product, having debuted in 2014 when the Trezor wallet was created, they are still in their infancy. This conclusion is based on the fact that only a few hardware wallets are available, while the list of desktop and web-based versions is long. 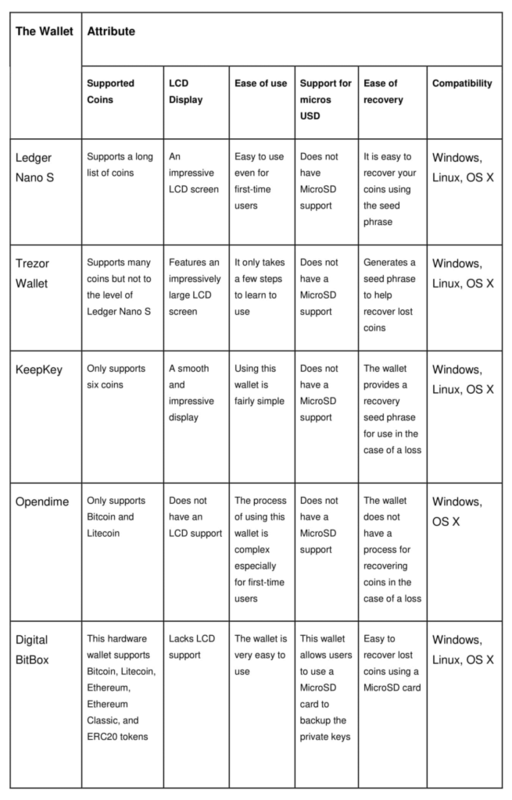 From this crypto hardware wallet comparison, the best wallet for your situation should be the one that is secure. When selecting a wallet, it is important to establish the nature of transactions that you will be completing. For example, if you want to hold the tokens over a long period, the best option might be Ledger Nano S or Trezor. For a person who wants to make regular payments such as buying cars or other high-value items, the Opendime wallet might be the better option. Remember that even with the best hardware wallet for cryptocurrency, you still need to be careful to keep your coins safe. For example, you should never share private keys with third parties, and the computer running the transactions should always be up to date in terms of virus protection. Can XMR Become the Best Crypto with Monero Hardware Wallet? 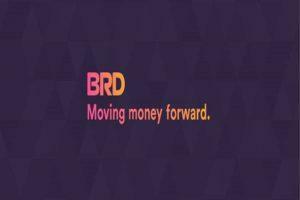 Bread Wallet Review: Is It The Ultimate Bitcoin Wallet?